As an artist I tend to be a visual leraner (go figure!). Connections are made at times that I sometimes don't expect. 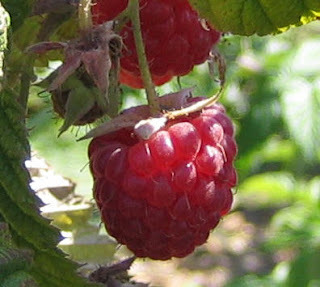 Last night I was in my small raspberry patch enjoying the luscious, ripe fruit. We have never had such a bountiful crop of extremly large berries. What is different this year to produce such a wonderful harvest? Is it the water, the soil, the light, or did I actually remember to do the tedious chore of pruning the prickly branches last fall? While munching and collecting berries John 15:2 came to mind. It says: He cuts off every branch in me that bears no fruit, while every branch that does bear fruit he prunes so that it will be even more fruitful. As a gardner and as a Christian I have learned that even fruitful branches need pruning. So this week I am thankful for the visual of the raspberry bushes that have reminded me that the more fruit we bring forth, the more we abound in what is good, the more our Lord is glorified. So I look inward to see what I need to prune from my life today (I'm afraid there is always much to choose from)...and hopefully this fall I will remember to prune the raspberry bushes also!